No one can truly guarantee the results of a good media placement. Speaking of which, when it comes to targeted advertising, Stella Artois Cidre has just launched a weather-detecting ad campaign by working together with creative agencies Posterscope and Liveposter. Now, that’s something to raise eyebrows. Marketers who seek to get the best results by stretching every dollar they invested in their advertising efforts would definitely find this a good idea to garner results. 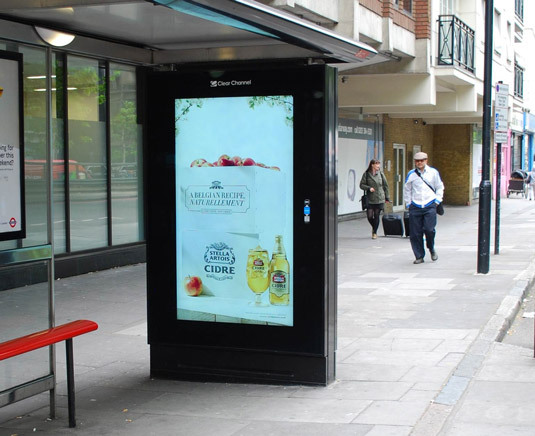 They came up with a creative idea: Create a system that would detect the weather on a real time basis and deliver the digital ad: a nice visual of apples with a chilled Stella Artois Cidre as the hero image. The fun part is when the device detects an increase in temperature, the cider ad flashes. Thus, churning the desire for a great summer beverage. If the temperature drops, the ads shall not appear. Andy Logan, marketing manager for Stella Artois Cidre said: “This summer, Stella Artois Cidre, will deliver the most sophisticated summer of refreshment, right on cue when the temperature rises. It is through these innovative technologies that we are revolutionizing the way we position and advertise our products. This has lead to yet another powerful tool we can leverage on to create more interesting advertising campaigns that are more targeted. Reblogged this on I Always Creative.